Re-constructing a local genealogy of the scientific modernization in North Africa and the Middle East is still a pending task. Research on modern Arab-Islamic scientists, physicians and engineers will help expand the collective memory of modernization in those countries by adding new, often badly-known or forgotten actors to its ranks. Biographies will also help illuminate the intrinsic connection existing between science and society, showing how science has always been a necessary element in plans for national independence, social change and democratic rule. 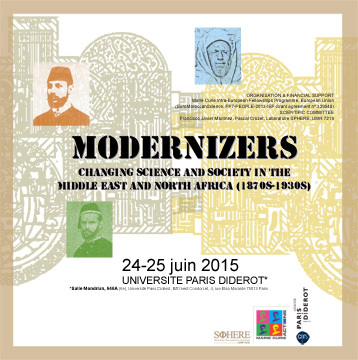 This conference will focus on the biographies of some late 19th-early 20th century scientists from Morocco, Egypt, Turkey, Iraq, Iran and Syria. Ottoman military officer, envoy and reformist. of the Moroccan doctor Mahboub ben al-Mahmoud (1888 – circa 1970). du Syllogue Littéraire Grec de Constantinople au début du 20e siècle. Jafar al-Askari : The Life of an Ottoman soldier and his role in Modern Iraqi Army. Entre Paris et Le Caire, la carrière d’un astronome égyptien, Ismail Mustafa (1826-1901). Kamuran Sirri (d. 1936) : Biography of a Turkish electrical engineer in the age of modernization. Political chemistry across the Baghdadbahn : A personal history of Dr. Cevat Mazhar. Mawlây Ahmad bin ‘Abdallâh al-Tanânî, known as al-Suwayrî (1811-1902). in the Late Ottoman Empire and early Republican Turkey. The Two Aspects of Scientific Modernization in Iran : Some Case Studies. Science Education at the Syrian Protestant College.